Nissan Al Babtain Continues Support of "ULTIMATE SOCCER ACADEMY"
Kuwait, 8 October 2018: Abdulmohsen Abdulaziz Al Babtain Company (AABC), the sole authorized dealer of Nissan vehicles in the State of Kuwait, is delighted to announce its third consecutive year’s sponsorship of one of the most prominent sports academies in Kuwait. The Ultimate Soccer academy that provides football coaching to kids between 5-18 years of age will continue to receive financial support and assistance as part of Nissan Al Babtain’s mission to encourage and advance the local sports arena. The Ultimate Soccer Academy hosts various activities and events year around, including field trips in Kuwait and abroad, as well as world-class soccer training programs under the supervision of highly skilled coaches. The sponsorship falls under Nissan Al Babtain’s corporate social responsibility strategy to promote sportsmanship, solidarity, and healthy opportunities for talented youth to pursue their dreams. The brand continues to fund various local and international tournaments throughout the year as it is driven by the universal goal of benefitting the societies within which it operates. The announcement of the renewal was made during the evening of a grand match between the world’s favorite team’s premier league – Manchester City and Liverpool. 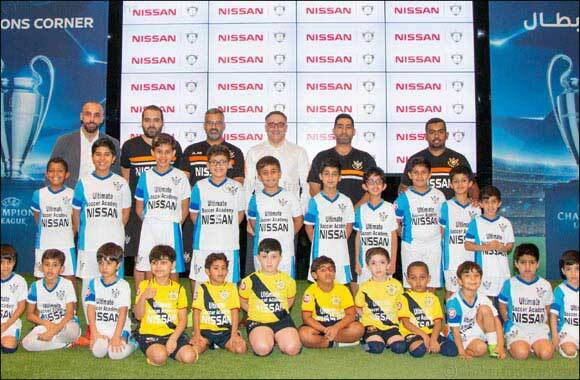 Nissan Al Babtain’s management held an interactive and engaging event for the aspiring soccer-players as they gathered to watch the match together. This sponsorship is a clear indication of Nissan Al Babtain’s dedication to upgrade the quality of sports in Kuwait by helping build a generation that practices teamwork, discipline and mutual respect for one another.